Coldspring-Oakhurst High School business students attended the Future Business Leaders of America (FBLA) Area 5 Competition in Houston on Saturday, Jan. 12. Over 1,100 students competed in 75 different events grouped into three categories: Individual, team, and chapter. Individual and team events focused on skills useful in leadership and career development; chapter events recognized overall achievement and performance in chapter management and growth. 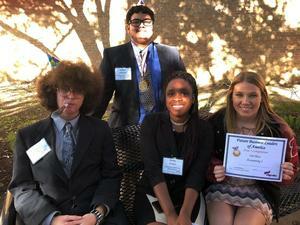 COHS senior Robert “Matt” Johnson won first place in Sales Presentation, and fellow senior Kayleigh Triggs took 5th place in Accounting. Both students will advance to State competition in March. COHS junior Kai Caraballo also competed in Impromptu Speaking, and senior Ebony Green competed in Organizational Leadership. Congratulations!